Mayor's race • Challenger Biskupski wins labor's support, while the incumbent looks to gain ground with Republicans' help. 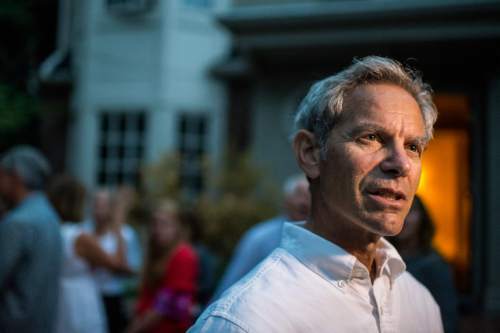 Chris Detrick | Tribune file photo Salt Lake City Mayor Ralph Becker talks to members of the media at his home in Salt Lake City Tuesday August 11, 2015. Steve Griffin | Tribune file photo Utah Sen. Bob Bennett has endorsed Mayor Ralph Becker's re-election. The support was touted in letters targeted to Republicans living in Salt Lake City. 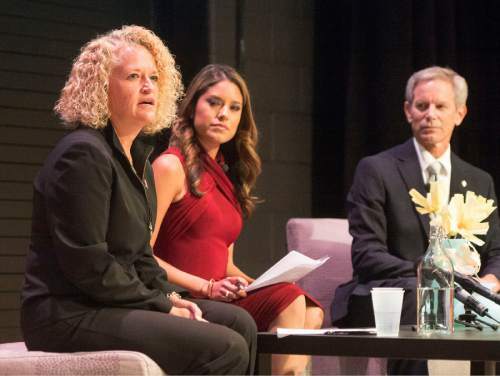 Rick Egan | The Salt Lake Tribune Jackie Biskupski answers a question as Silvana Effio, Telemundo Utah, moderates the debate between between Bikupski and Mayor Ralph Becker hosted by the Latino Community at the Sorenson Unity Center, Monday, September 14, 2015. 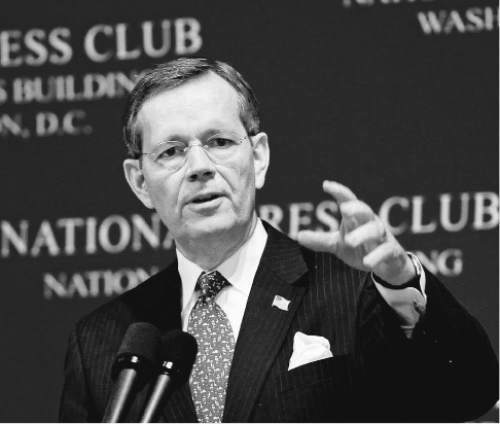 Former Utah governor Mike Leavitt speaks at the National Press Club in Washington, D.C. on December 19, 2007. Courtesy Leavitt Partners. Salt Lake City Mayor Ralph Becker is wooing Republicans in an effort to come from behind and capture a rare third term in one of Utah&apos;s last Democratic strongholds. The race, officially, is nonpartisan, but the last Republican to be elected mayor of Salt Lake City was Jake Garn in 1971. Nonetheless, 20 percent to 25 percent of the capital&apos;s registered voters are Republican. And the incumbent is in a deep hole, garnering just 31 percent of the primary vote to 46 percent for challenger Jackie Biskupski. Although he is a Democrat, Becker, prior to the Aug. 11 primary, distributed an endorsement letter from former GOP Sen. Bob Bennett that targets Republicans in Salt Lake City. More recently, Becker began running campaign ads on KSL-TV featuring former Gov. Mike Leavitt, also a Republican, throwing his support to Becker. In the meantime, Biskupski, a former Democratic state legislator, has been endorsed by 13 labor unions, including the Salt Lake Police Association; Salt Lake City Firefighters; Local 81; and the American Federation of State, County and Municipal Employees (AFSCME) Local 1004. 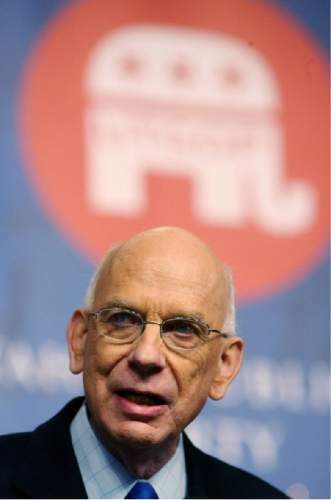 Former Salt Lake City Mayor Ted Wilson said the union endorsements signal strong Democratic support for Biskupski and that such backing makes Becker&apos;s Republican strategy a necessary one. "It&apos;s a strategic move, given the results of the primary," Wilson said. "The coalition Ralph had four years ago has drifted off to Jackie&apos;s camp. But there is a large number of Republican voters who are undecided." Indeed, a mid-July Salt Lake Tribune poll of Salt Lake City voters found 32 percent of Republicans were undecided, compared with 20 percent of Democrats and 29 percent of self-described independents. Biskupski, at that time, had twice as much support among Democrats as Becker and an edge among independents. But Becker had a slight lead over Biskupski among Republicans. Although GOP numbers are relatively small in Salt Lake City, they do turn out to vote, said Tim Chambless, a University of Utah professor of political science who also is affiliated with the Hinckley Institute of Politics. Becker is portraying himself as the centrist candidate who can appeal to Democrats as well as Republicans, Chambless noted. But capturing a majority of Republican voters may not be enough. "Republicans do have a tendency to vote. But there may be too few Republicans to make a difference," Chambless said. "But when you&apos;re behind, you do a full-court press. You&apos;ve got to try everything." Becker&apos;s campaign manager, Matt Lyon, said the mayor enjoys broad bipartisan support. Prominent Democrats backing him include Utah House Minority Leader Brian King, D-Salt Lake City, Salt Lake County Mayor Ben McAdams and former Democratic U.S. Rep. Karen Shepherd. For her part, Biskupski  a top administrator for Democratic Salt Lake County Sheriff Jim Winder  said she is not concerned with Becker&apos;s endorsements from Bennett and Leavitt. "This is a nonpartisan race, and I&apos;m approaching it that way," she said. "Party affiliation doesn&apos;t matter to me; I&apos;m reaching out to everyone." Biskupski did, however, tout her endorsements by labor organizations, particularly those that represent employees of Salt Lake City. "People who work in our city are looking for new leadership," she said. "They have told me they don&apos;t have access to the mayor. They want to know they are being heard by the mayor and he takes them seriously." Labor endorsements for Biskupski will hurt Becker, Wilson said. "Labor leaders have said Ralph has not been willing to meet with them," Wilson said. "That feeds into Jackie&apos;s claim that Ralph is unaccessible." The general election is set for Nov. 3.